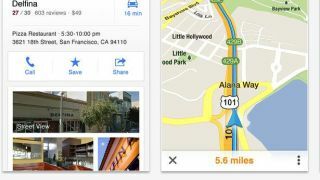 The arrival of Google Maps on the App Store may have prompted a large number of users to finally make the leap to Apple's iOS 6 software. Mobile advertising company MoPub, which monitors ad impressions for over 12,000 apps, saw a 29 per cent leap in impressions from iOS 6 in the five days following the approval of Google Maps on Dec. 12. The biggest spike in unique iOS 6 users came over the weekend when users may have had more time to perform the lengthy software update. MoPub CEO Jim Payne told TechCrunch: "We observed since the launch of Google Maps for iOS 6 a 30 per cent increase in unique iOS 6 users, and we think it's related to Google Maps. "It verifies the hypothesis that people were actually holding back to upgrade until Google Maps was available." Apple controversially ditched the popular Google Maps application in favour of its own in-house mapping solution when iOS 6 arrived back in September. However, the launch proved to be an unmitigated disaster for the company, angered its customers and left many refusing to leave iOS 5 until Google's app was made available from the App Store. Now the favoured navigation app is back in business on iOS devices, it seems those users are ready to embrace the latest version of the mobile OS.